Once you have imported the sinespace Editor Pack into Unity, you will find a Gesture Preview Scene. 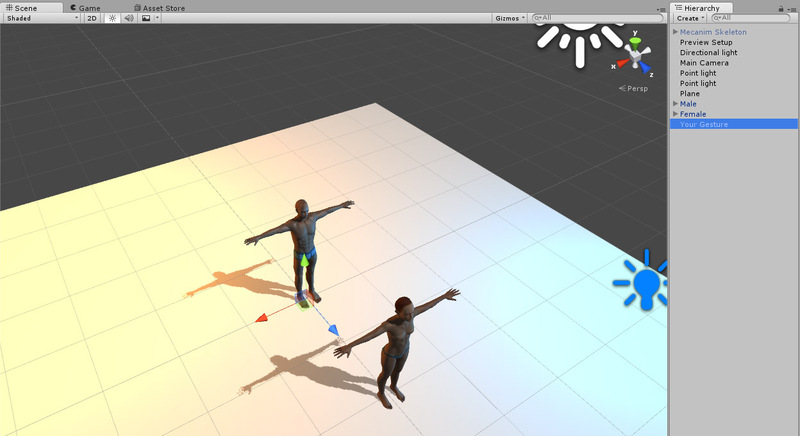 This scene contains two rigged character models and is set up to allow you to assemble and test your gestures. Add only one gesture into the scene at a time. The sinespace virtual world uses the Unity game engine and supports animation files imported as part of a 3D Model file (such as FBX). If you are used to using BVH files there are utilities online that can convert from one format to the other. When you import an animation into Unity you will then add that animation to a game object. You can find samples for single person gestures and multi-person gestures in your project window. Go to Sample Art>Gestures and there will be two sample prefabs. Sample 1 is for single person and Sample 2 is multi-person. That game object has scripts added to it, depending on what you are doing with your gesture. Please see the Single Person Gesture page and Multi-Person Gesture page for more information on how to set gestures up. Your gesture will also have a Virtual Goods Script attached, which allows you to add product information and submit the item to the store and / or your inworld inventory.